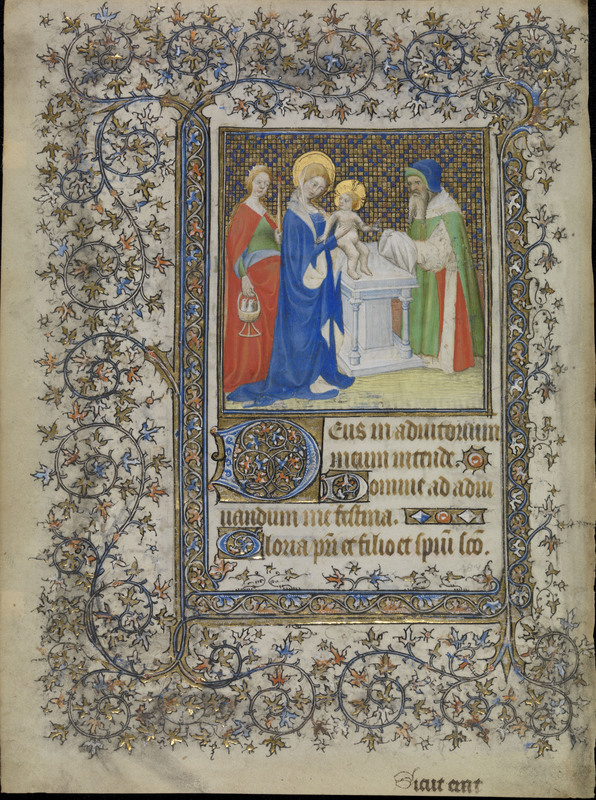 The Baillieu Library at the University of Melbourne holds four bi-folios that were part of a book of hours dated with confidence to 1408 and owned by Sir Alfred Chester Beatty (1875-1968), an American mining magnate. Prior to Beatty’s ownership, the book was in the collection of John Boykett Jarman (died 1864), a London goldsmith and jeweller. The book suffered considerable water damage while it was in the care of Jarman. Libby Melzer, Senior Paper Conservator at the Centre for Cultural Materials Conservation at the University of Melbourne, provided an excellent account of the damage and how it happened in her article ‘Flood, Fire and Water: Fragmentary Manuscripts in the Medieval Imagination Exhibition‘ published in 2008 to coincide with an exhibition at the State Library of Victoria. 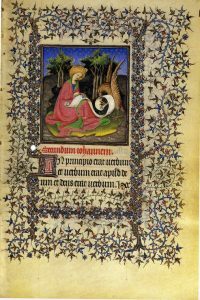 While the book of hours was in Beatty’s care, he elected to remove some of the miniatures that were in better condition. 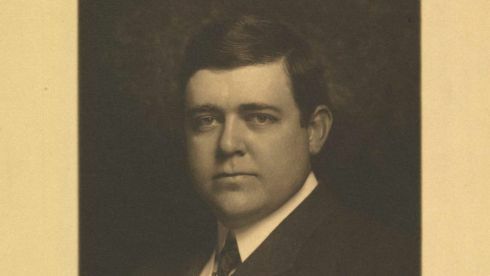 After Beatty’s death, Alan Thomas purchased the remains of the book and sold the leaves piecemeal. The Melbourne folios were purchased from Thomas in 1974. 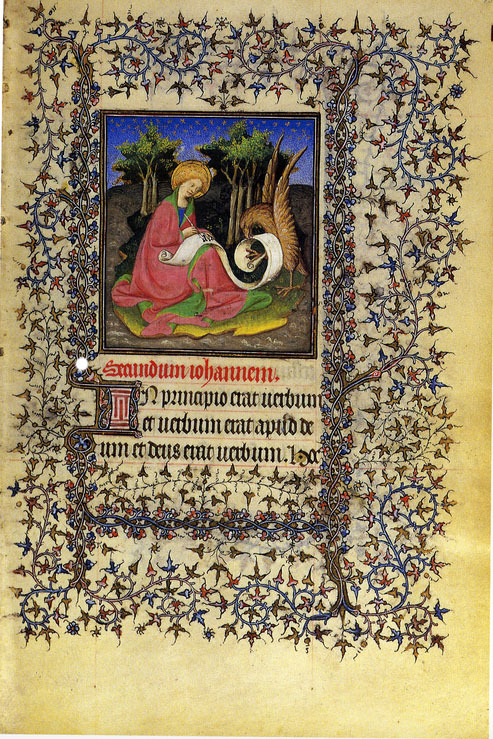 Folio 1 recto – the Annunciation miniature. 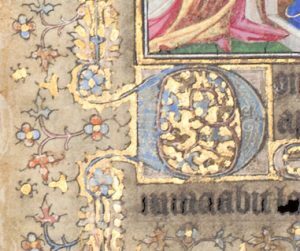 The stylistic treatment of the border, the u-shaped staff and major initial in this folio are different from the other folios in the book, raising questions about whether a different artist contributed to folio 1 and perhaps this leaf was originally intended for another book of hours. All of the leaves have a border of cusped red, blue and gold ivy leaves sprouting in all directions. In addition, most of the borders are also interspersed with spiked berries and shapes resembling little flying comets with squiggly lines. 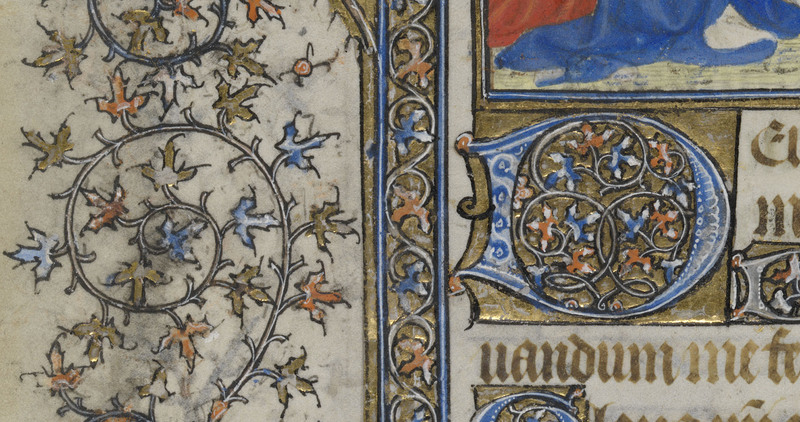 However, folio 1 also contains small blue and mauve petalled flowers and the vines of the ivy leaves seem drawn in a more controlled or flattened manner versus life-like. 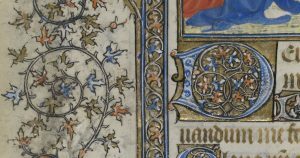 Leaves with miniatures are surrounded by thick u-shaped foliate staffs (also known as baguettes) framing both the miniature and the text. 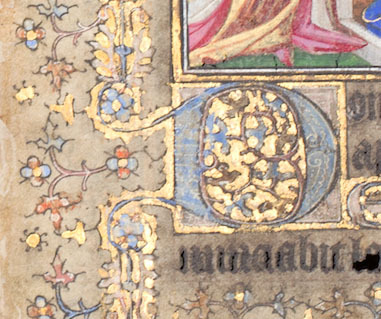 However, in the case of folio 1, the major decorated initial is anchored at the top and the bottom of the left staff and a gap in the staff exists where the initial resides. This gap in the staff does not occur in the other leaves. Figures. Folio 1 recto, major initial detail compared to folio 48 verso, major initial detail. The mise-en-page of this leaf is more consistent with MS 265 at the Walters Art Museum in Baltimore. Perhaps both books were in production at the same time in the same workshop and folio 1 was bound into the wrong book. 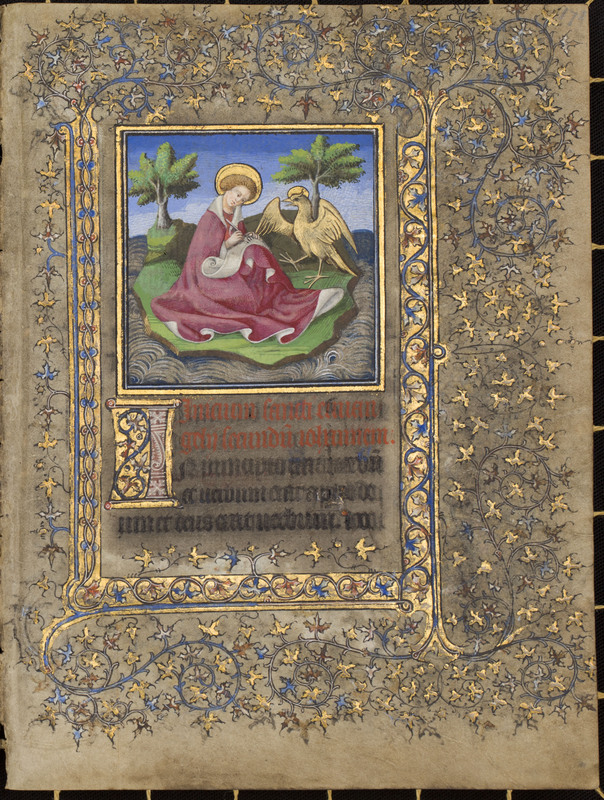 Interestingly, Walters MS 265 does not contain a miniature of the Annunciation. 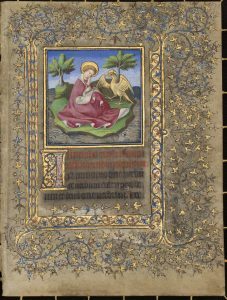 Folio 179 recto – the John on Patmos miniature. John is shown on the Isle of Patmos where he was exiled by the Roman emperor Domitian. The eagle, John’s symbol, is trying to get his attention as he writes on a scroll resting on his knee. John is seated between two umbrella-shaped trees. The compositional convention of this miniature with the figure close to the edge of the frame and an attempt to portray a true landscape is very similar to the John on Patmos miniature included in Walters MS 265. Both miniatures employ a horizon that darkens to a deep blue in an upward direction and a pale green terrain that darkens as it approaches the horizon. In addition, the treatment of John’s bright pink drapery is the same in both miniatures with wave-like folds at the bottom hem. The similarities between the miniatures suggest the same workshop created both leaves. 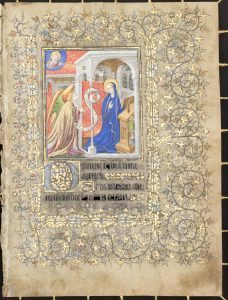 If the same workshop was working on Walters MS 265 and Beatty’s book of hours, this further supports the notion that the wrong Annunciation leaf was tipped into the Beatty book of hours. 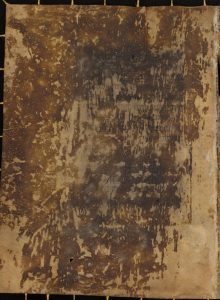 Folio 186 Verso. 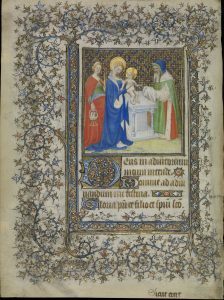 Beatty’s book of hours is dated in the colophon on folio 158 verso that is now housed in the Chester Beatty Library (Factum est anno mº ccccº viiiº quo ceciderunt pontes parisiis). Recently, it was discovered the same date is hand-written on folio 186 versus (anno mº ccccº viiiº) of the Baillieu Library fragment. 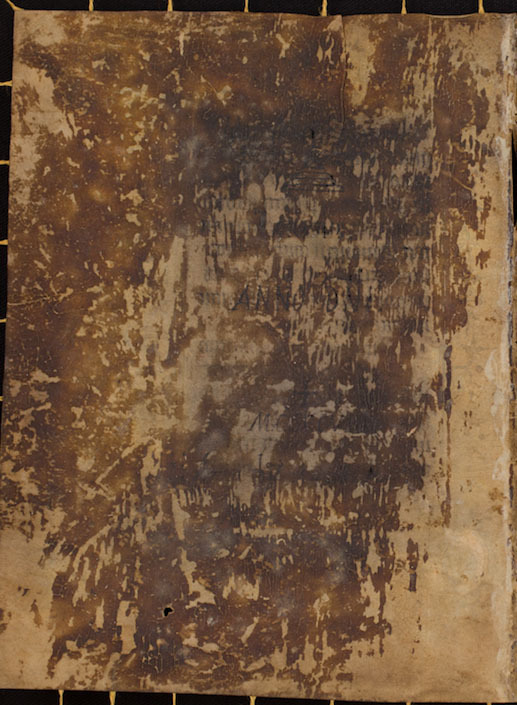 The leaf is covered in glue residue and may have served as a pastedown for the back cover. This is an important discovery since no other leaves show signs of use such as thumbprints, added texts, glosses or notes. Scholarship on this book of hours has waned since it was unstitched and the leaves were dispersed across the globe. However, digital reassembly allows scholarly research to continue and new discoveries involving the individual leaves housed in various institutions to be made. Backhouse, Janet. ‘A Victorian Connoisseur and His Manuscripts: The Tale of Mr. Jarman and Mr. Wing’, The British Museum Quarterly, 32 (3/4), (1968): 76-92. Byrne, Donal. ‘Manuscript Ruling and Pictorial Design in the Work of the Limbourgs, the Bedford Master, and the Boucicaut Master’, The Art Bulletin, 66 (1), (1984): 118-36. Farber, Allen S. ‘Considering a Marginal Master: The Work of an Early fifteenth-Century, Parisian Manuscript Decorator’, Gesta, 32 (1), (1993): 21-39. Manion, Margaret M. and Vines, Vera F. Medieval and Renaissance Illuminated Manuscripts in Australian Collections, Foreword by K.V. Sinclair. (Melbourne ; London and New York: Thames and Hudson, 1984) 240. Melzer, Libby. ‘Flood, Fire and War: Fragmentary Manuscripts in The Medieval Imagination Exhibition’, The LaTrobe Journal, No 81 Autumn, (2008): 70-81. Middleton, John Henry. Illuminated Manuscripts in Classical and Mediaeval Times; Their Art and Their Technique (Cambridge,: University Press, 1892) 270. Thomas, Alan G. Catalogue Twenty-Three, Alan G. Thomas, Bookseller, (London: Alan G. Thomas, Bookseller). 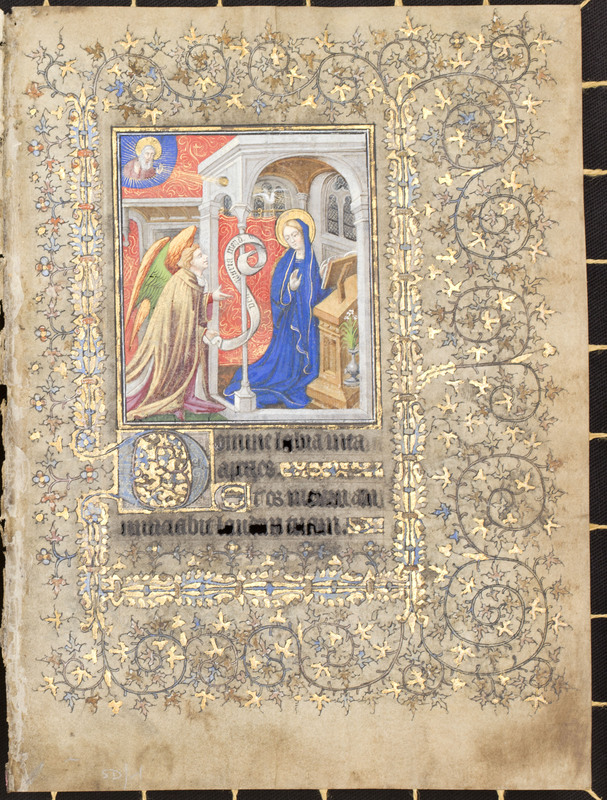 Winslow, Karen D. The Life, Death and Rebirth of a Book of Hours once owned by Chester Beatty. MPhil in Art History, Art + Ireland thesis, 2 volumes. Trinity College, Dublin (2016).